Clearly, the 3rd&4th Avenue rezoning will not serve its purpose. The voluntary middle-income provision lacks incentive: it won't be built. The 120-foot height cap will continue to encourage development, and the huge 57% increase in residential density will target every small old building for demolition -- eviction -- and redevelopment. In the craze for contextual zoning, no one seems to understand that under the old zoning, huge overdeveloped towers were typically built by purchasing air rights from smaller buildings. Those smaller buildings, once having lost their development rights, have no room to develop. That protects them and their tenants. In the rezoning, the old commercial allowable floorspace (6 FAR) is unchanged. The 6.5 community facility (dormitories) is unchanged. The only change is the huge increase from 3.44 residential FAR to 5.4, a whopping 57% increase. Instead of a few towers protecting its smaller neighbors, this rezoning will eventually replace every old building with 57% larger ones rising up to 12 stories. This is an improvement? Who is benefiting besides developers and their minions? The EV/LES rezoning balanced upzoning with downzoning, development with preservation. But this 3rd&4th Avenues rezoning includes only upzoning, no downzoning, more development, zero preservation. And the voluntary middle-income housing has no incentive: developers get only an additional 5% market-rate if they develop the 20% affordable units. Why would a developer build affordable housing just to get 5% more market-rate space when he just got 57% for free, no strings attached? Not without a kickback. P.S. 122 has renovated with a pristine surface of white poured stone. It's clean and new, but undistinguished. Dull in its glaring brightness, fawning and monkeying the commercial success of the clean edge, it proudly flaunts banality. 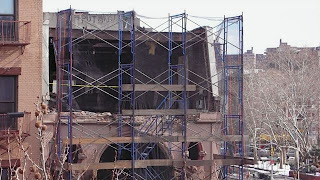 Sadly, it covered one of the most poignant, beautiful and resonant façades in all Manhattan, including its crumbling brownstone Romanesque-Dutch influenced entryway. Ruins can't be made: they become, despite themselves. That's their essence and their point. They tell us that we cannot control our world, that time and nature rule, that human genius is an ambition not an accomplishment, that foiled hubris can be noble and admirable and beautiful because it is an attempt at the infinite in a finite world. Ruins have pathos. And ruined hubris too: otherwise it would be oppressive triumphalism, like glass and steel. Whenever I walked past P.S.122's, I always thought immediately of the painting in the early Flemish room at the Metropolitan Museum, variously attributed over the years (I think it's now Petrus Christus, but I can remember when it was a Hubert van Eyck, or school of van Eyck, and who knows next) strangely depicted from an aerial and oblique view showing a pristine church surrounded by the green, natural world. Between the constructed and the earthy sward lies a single step, degrading. 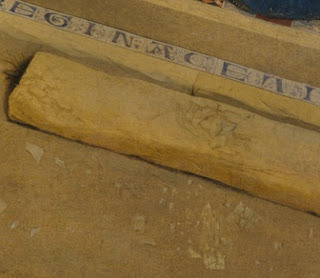 The painter has taken great effort to render the details of this step, its smooth, worn-away surface as well its cracks and clefts and its exfoliated layers. Stone chips lie scattered on the earth before it. It seems the painter wants to show a contrast between the fallen world of human fashioning and the perfect world of god's kingdom embodied in this perfect church building. But the church is much less interesting and appealing than this one stone step. 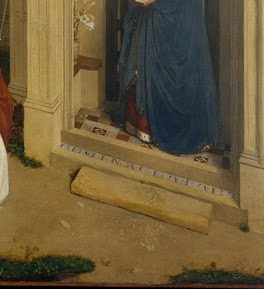 The church is pretty enough, so is the surrounding foliage and the angel and Mary there, but the step is mesmerizing. The more you look, the more you think: about human frailty, human failure, about history and inevitability, time and loss. And while you think and muse, you also feel, more and more, that this step is familiar, welcoming and warm. It holds no pretensions, it demands no expectations. It's where we live; it's where we die. It's most us. P.S.122 could have protected the public from its flaking sandstone with a modest awning or eave, but instead, it swallowed it up forever. Demolishing an old townhouse to build a hotel will at least benefit someone -- the owner, with personal profit. But covering this ruin of over a hundred years, benefits no one. It's a completely gratuitous act. It's not a humanitarian disaster, but if we provide for basic needs of humanity without providing a human environment, what have we accomplished? A while back I took a group of inner city 19-year-olds from a prison halfway house to tour the neighborhood, showing them how history, economy and social structure explain the form of the buildings. They ate it up and assimilated the knowledge instantly, but when I pointed out an old tenement covered with terra cotta, they went bananas. "Look at the detail!" "That's MAD detail!" I couldn't get them away from it. Later, at the end of the tour, talking with one of the kids, I asked him what he wanted to do with his life. The answer: "I think I want to be an architect." Don't tell me only the rich care about architectural beauty, the plebs don't. That's just bigotry and the true snobbism of paternalism. 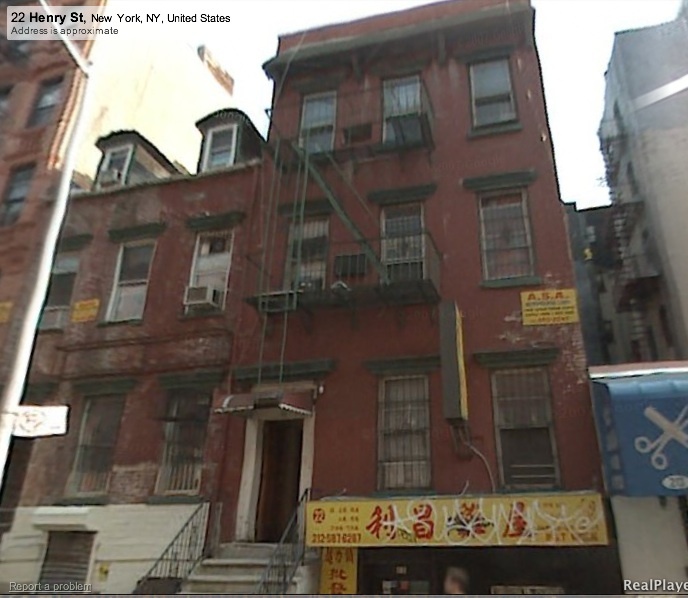 A request for evaluation (RFE) had been submitted to the Landmarks Commission for these two historic buildings, 22 and 24 Henry Street in January. On February 4, the owners filed for a construction shed. Now the buildings are gone. The old town houses were much smaller than the zone allowed, which means that the owner can build a much larger structure now. 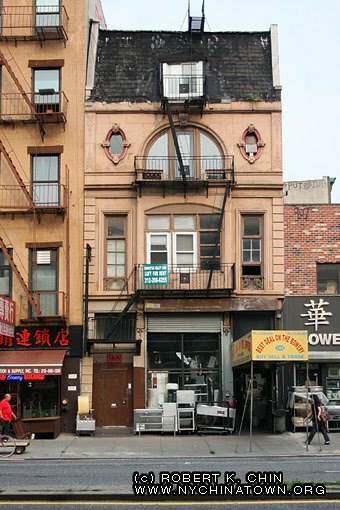 It is common for a developer to demolish an old structure to avoid a landmarking designation. In the world of real estate development, history and aesthetic value must be destroyed, otherwise it stands in the way of "progress" (defined as personal gain). But crap is okay. Crap is great. Crap doesn't threaten money. There's no protection for crap or against it. One piece of crap can easily be transformed into another piece of crap for profit. As long as the city is full of crap, developers can play freely. So it's important for them to build as much crap as possible, and leave as much crap as possible, their own or their predecessors, producing a great, expansive, comprehensive and complete heritage of megalopolictic crap. This is the architectural second law of developodynamics: all value tends towards crap. The two buildings were both listed on the National Register of Historic Places as part of the Two Bridges Historic District. Unfortunately, the National Register does not protect buildings as the city Landmarks Preservation Commission can. The owners filed in February for "minor alterations" with "no change of use, occupancy or egress." There is no filing for demolition at the Dept. of Buildings. For structures largely ignored for two centuries, they were in remarkably good shape, and because they eventually were surrounded by a slum -- part of New York's oldest slum -- they were neglected and so largely unaltered. But the neighborhood -- Henry, Madison and Monroe Streets around Catherine and Market Streets -- has seen newly built developments. 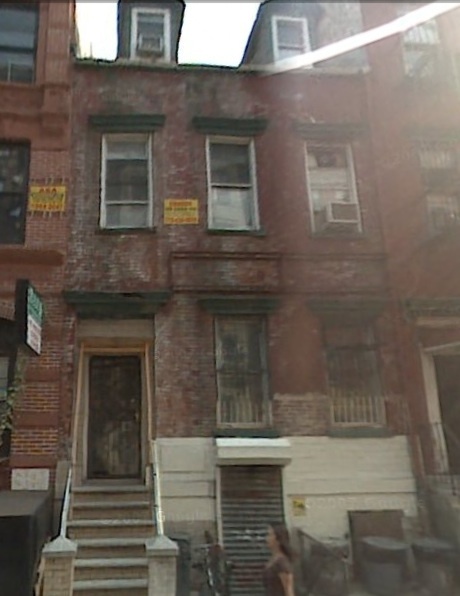 Two of the oldest structures in New York were just demolished on Henry Street, 22 and 24: a four story row house and, next to it, a diminutive, narrow town house. Both must have dated at least as back as the 1820's; the town house may have dated back further. I did not have time to inquire about what is replacing it, but there is a girder structure up already. The screen caps attached, cut from google street maps, don't do justice to them. 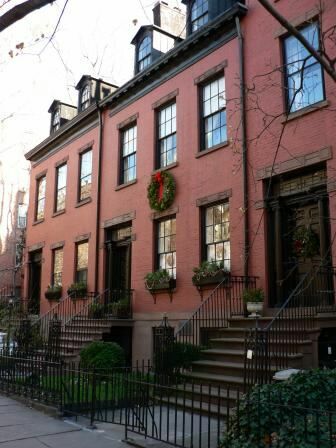 They were a striking little piece of the early 19th century, unusual because of the pairing of a town house-with-dormers adjacent to a row house with a fully built fourth floor covered by a unique wood awning in lieu of a cornice. I always took visitors to see them on the Chinatown/Five Points tour. After the Mooney House, they were the oldest buildings around, and almost unaltered. 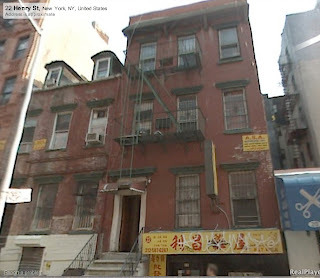 The demolition of a town house in Greenwich Village would spark a protest, an outrage and an angry movement, but far to the east in Chinatown, no preservationists seem to notice or care. And yet, these two small buildings were probably older than anything in the Village, and in a neighborhood with a much longer and complex history.